Our online store has been revamped and now includes all the new items, including our latest studio album "Chrysali"s and our first ever Blu Ray release "Live From The Edge". Click on THIS LINK and you'll be there in an instant. And remember to keep checking often as new items are added almost on daily basis. Thanks in advance for your support! 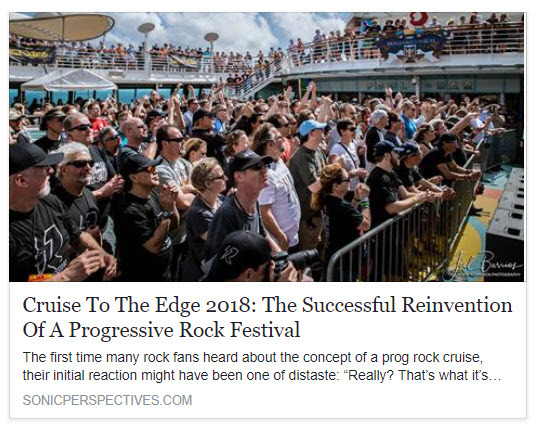 Excellent Cruise to the Edge article published by Sonic Perspectives and written by the talented Scott Medina. "...Some bands have seen their careers flourish thanks to repeat bookings, such as Haken, IO Earth or especially Bad Dreams, and they even plan new album releases to coincide with the Cruise schedule..."
We are deeply grateful to be the only Latin American band to take part of this event and to be surrounded by so many luminaries of the prog-rock scene!